“What do you mean by the word community?” is a question I’m often asked when talking about the Creative Community Fellows program. And rightfully so. The term community is so over-used that it has become a buzzword in our arts and culture circle. For us at NAS, community is rooted in commonality and belonging, yet can be experienced in many different modalities – geographic, virtual, identity-based and more. Creative Community Fellows New England supports cultural entrepreneurs working at the intersection of culture and community. When Fellows apply to the program, we don’t provide a definition of what qualifies as community-based work. Rather, we ask that they tell us what community means in their own context. 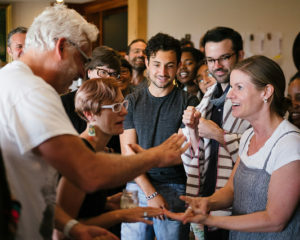 Over the next two weeks, participants in the Creative Community Fellows New England program will unpack the term community by answering the question “what does community mean to you?” Through these reflections, we look forward to celebrating the various facets of community-based arts and culture work happening across the New England region. Follow along each day this week to hear stories from this burgeoning network that’s being woven across New England. Read more about the work of the Fellows here. Sunny Widmann is a Director at NAS. Sunny believes that arts participation engenders empathy and builds cross-cultural understanding, and is interested in how the arts work in different communities across the globe. Sunny likes to spend her time practicing yoga with friends, or planning her next great adventure.